World Big river, deep trouble: Can the Mighty Mississippi’s crisis be averted? David Dahl, a competitive cane racer, paddles along the Mississippi River dividing Minnesota's Twin Cities of Minneapolis and St. Paul. All along the river, environmentalists, farmers and politicians are sounding the alarm over environmental damage and flood risks. As it emerges eagerly from Minnesota’s Lake Itasca, the Mississippi River doesn’t yet know its fate. Seven meters wide and knee-deep, it rushes past thick stands of old-growth red pine and tamarack. The water is fresh, even drinkable. From the taiga, it begins a steady descent of nearly four thousand kilometres – first north, then south – greedily absorbing other major rivers, at times breaching its banks and flooding nearby land, before finally emptying into the Gulf of Mexico as a bloated, sickly body of water. Agriculture is poisoning its waters. At the same time, the numerous locks and dams on the river are in dire need of repair. Floods, long a reality of life along its banks, are becoming worse and more frequent. The Mississippi is in crisis. The mounting crisis, which has left an unlikely coalition of environmentalists, policymakers and farmers scrambling, has been decades in the making. “The price tag for environmental neglect has come due,” says Colin Wellenkamp, executive director of the Mississippi River Cities & Towns Initiative, a group representing 85 mayors in cities scattered along the river. Since 2005, the cost of natural disasters along the Mississippi River has topped $200-billion, says Mr. Wellenkamp, in part due to the removal of wetlands that would have previously helped absorb floodwaters. 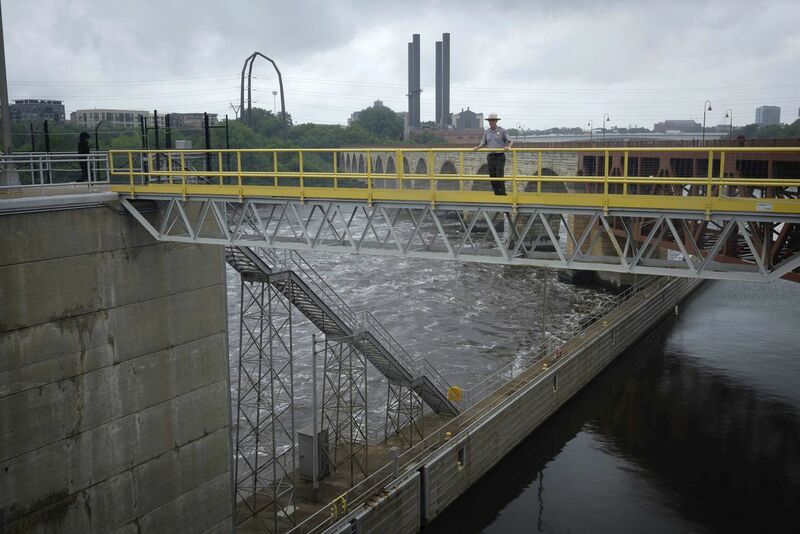 In St. Paul, Minn., John Anfinson stands atop the first lock and dam on the Mississippi. The locks and dams, overseen by the US Army Corps of Engineers, have fundamentally altered the river's physical structure. Along the river, animal waste and fertilizer are among the largest contributors to poor water quality. Corn and soy are the main crops along the river, mostly grown for animal feed. Both require large amounts of fertilizer and don't promote soil health, critics say. 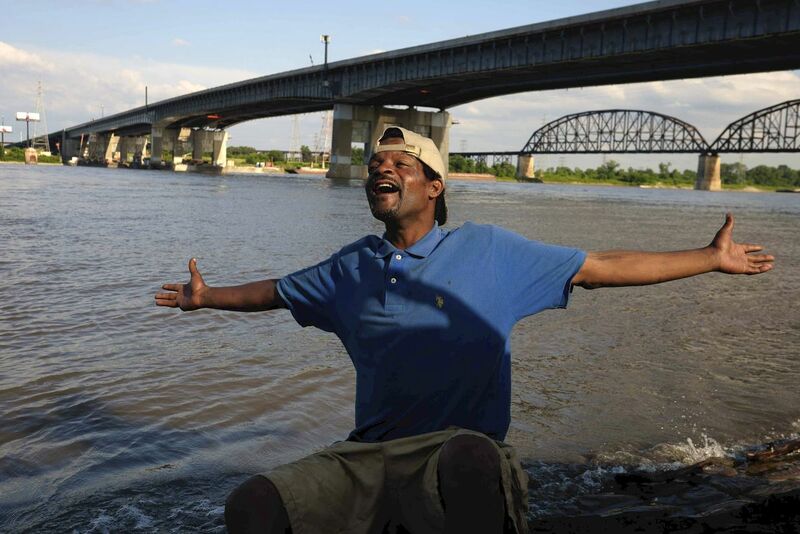 In St. Louis, Mo., Darrell Spinks recounts how his uncle once swam across the river. The Mississippi's network of locks and dams terminates in St. Louis. By the time it reaches the city, the river has transformed from a small flow into a critical transportation hub. Few bodies of water enjoy the near-mythical status of the Mississippi. Flush with silt, the river gave rise to the numerous Indigenous societies along its shores. It was equally critical in early farming attempts by colonial settlers. By the mid-1800s, the Mississippi was a bustling and critical thoroughfare as steamboats moved timber, coal and cotton to market. Because of the erratic behaviour of a river, water depths were inconsistent, creating problems for shipping. To resolve this – and to make what Mr. Anfinson calls the “biggest change to the river since the glaciers” – 29 locks and dams were constructed nearly 90 years ago. Today, the river is a navigation channel with barges ferrying more than 175 million tons of goods each year to supply international markets, the largest of which is Canada. elevation above sea level of the dams and locks. were inconsistent, creating problems for shipping. To resolve this 29 locks and dams were constructed. above sea level of the dams and locks. of the dams and locks. Full control over the Mississippi, often likened to domesticating a wild animal, has long been the dream and ambition of the United States Army Corps of Engineers, the government body tasked with managing the infrastructure on the river. By most metrics, the Corps has won its battle against the water, masking the demise of the river. On paper, it has straightened, walled and dammed the Mississippi into submission. The Corps now has as much control over the river as it likely ever will; with an array of technical monitoring tools, they have the power to raise and lower water levels throughout vast stretches of the Upper Mississippi. Its once-surging flows, now blocked by dams, have been reduced to near-listless pools. The Corps’ motto, “Let us try”, belies the scope of their engineering dominance; they even have their own replica dams for testing. That success, cautions Mr. Wellenkamp, comes with a price as climate change exerts pressure on the region. An extended shutdown of the river – through extreme flooding or drought – would effectively cripple the complex agricultural distribution networks of much of the world. A severe drought in 2012 brought the shipping industry perilously close to shuttering the Mississippi. Hundreds of millions in profits were lost as few barges made the journey along shallow sections of the river. The stakes remain high; commerce on the river employs more than one million people and generates half a trillion dollars in economic value each year. There is no water system more vital to the American economy than the Mississippi, but with each passing year, risks increase. Cities have gobbled up land well within the river’s historic floodplains, protected by barriers that divert the natural course of the water. The rapid development has stripped away forests, marshes and wetlands that once absorbed – and thrived on – floodwaters. Major flood events are becoming more frequent, and many residents lay blame on the heavily built-up infrastructure constricting the river. 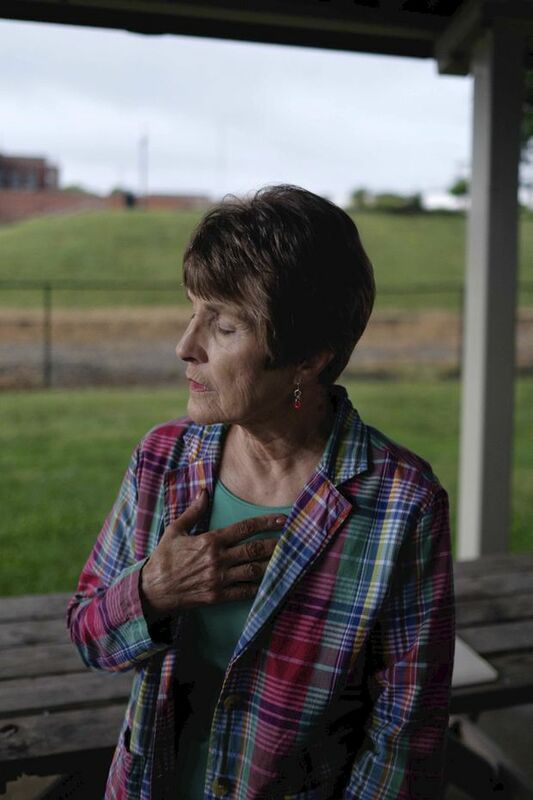 Nancy Guyton is a vocal opponent of unauthorized levees in Missouri and Illinois. For the last 43 years, Ms. Guyton has watched the waters of the Mississippi ebb and flow over the banks and overwhelm farmland. “Living on the river is a different way of life. But I can tell you – when you farm along a river, every once in a while, you’re going to experience a flood.” Her husband, who farms nearly 2,000 acres, has lost crops to flood waters in recent years. But she fears things are getting worse. A recent study in the scientific journal Nature arrived at the same conclusion: the overengineering of the river is likely far more responsible for the recent spike in large floods, even more than climate change. As residents feud, the Corps – who has authority over the levees – is struggling with its own limited financial resources. “We don’t have the funds to do the major work we need to do. All it takes is one lock to shut the system down,” Jon Hendrickson, of the Corps’ Mississippi Valley division, recently told reporters. While the infrastructure is deteriorating, the Mississippi’s waters are also causing worries. Darrell Steele’s farm in Washington County isn’t large by Iowa standards, where virtually all of the state is dedicated to agriculture. He owns 1,300 acres of gently rolling land, capped with a leafy mass of green. Like his neighbours – and their neighbours – he grows corn and soybeans, most of which is harvested, shipped down the river. There is vast global demand for these products, and the Mississippi provides a competitive trade route for farmers. 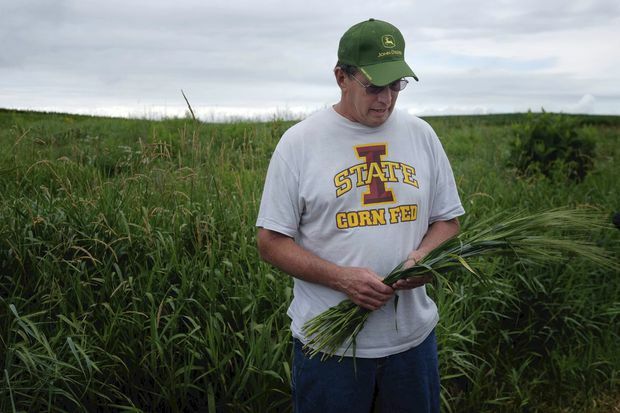 His crops – which will be turned into ethanol and animal feed – need nitrogen to grow, and farmers like Mr. Steele dutifully add fertilizers to the soil to encourage that growth. He knows how well his crops will react to the soil and the fertilizers he uses. He knows the delicate relationship between its acidity and the temperament of microbes teeming in the brown earth. The Iowan has it practically bred into him: he’s a fifth-generation farmer. And he knows his soil – and the chemical thousands of other farmers put into it – is part of a growing problem on America’s most important river. Water teeming with nitrogen and phosphorus leaves tens of thousands of farms and eventually reaches the Mississippi. When the tainted water merges with the river, the nutrients foster algae blooms, inevitably sapping the surrounding water of its critical supply of oxygen. Aquatic life collapses, and the area in the Gulf of Mexico where the Mississippi empties becomes a dead zone. Each year, 1.7 million tons of nitrogen and phosphorus are flushed into the river – the bulk of which comes from agriculture-intensive states. “There’s no one out here that I know who wants to ruin the environment or wants dirty water. Because we drink it too,” says Mr. Steele. Darrell Steele, a fifth-generation farmer, knows his fertilizer-rich soil is part of a growing problem on the Mississippi. Nitrogen in the water also has negative human consequences. Researchers at the University of Iowa have found troubling links between elevated nutrient levels in drinking water – within federal requirements – and numerous health concerns, including colorectal cancers, thyroid cancer and neural tube defects. More than 20 million people get their drinking water from the Mississippi. “I’ll bet the vast majority of people turning on their faucets have no idea,” says Mr. Anfinson, the environmental historian. Changing behaviour in Iowa, where 92 per cent of the state is farmland, is near-impossible. It’s a similar case in Minnesota, which has lost nearly 4 million acres of grassland and forest to farming over the last decade. 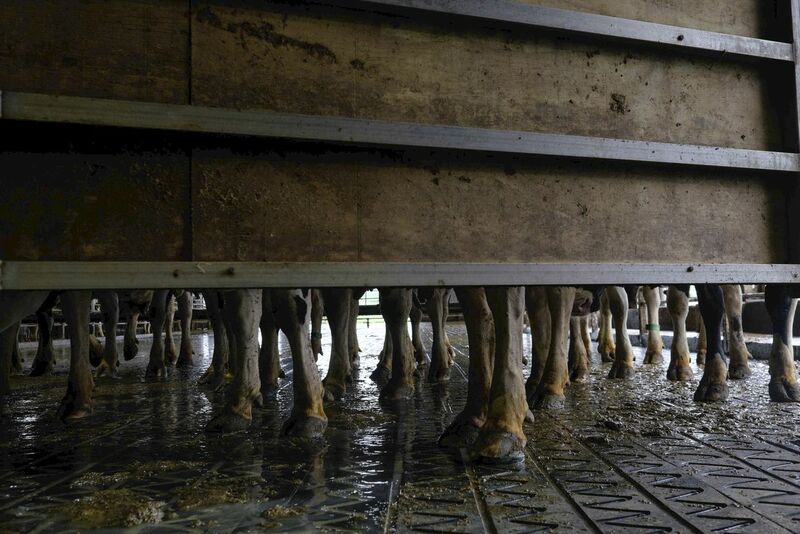 There are 4.6 million pigs in Illinois and more than one million cows in neighbouring Wisconsin. The farms are critical to America’s economy, and the river is critical to the continued success of the agricultural industry. The convoluted nature of the distribution network and strong demand for the crops resists the simple dichotomy of farmer as hero or villain. But the damage wrought by the farming is becoming increasingly clear. On many farms along the river, years of aggressive tilling has stripped the soil of its critical, nutrient-rich top layer, exposing a clay-like mantle that is difficult to cultivate. 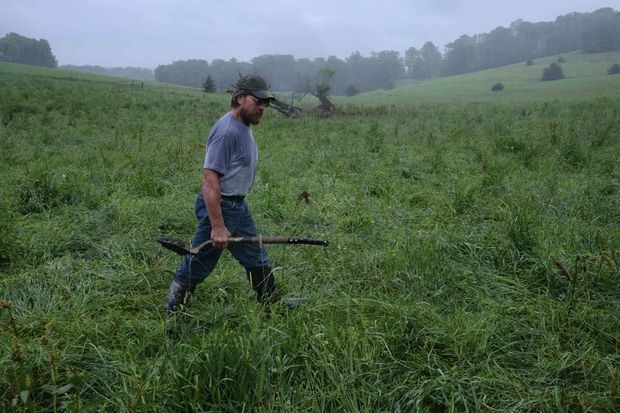 At the same time, studies of rainfall by the U.S. Geological Survey – and anecdotal evidence from farmers – suggests the net level of rain hasn’t changed over the last decade. What has changed, however, is the intensity and duration with which it falls. Rather than an even spread of rain throughout the year, short, intense bursts strike farms. These torrents are difficult for soil to absorb, meaning there is a large amount that fails to penetrate and instead becomes runoff, destined for the Mississippi. While the National Oceanic and Atmospheric Administration predicts a 30 per cent increase in rainfall over the next 30 years along the river, deteriorating soil quality is likely to push the bulk of the rain water – and much of the top soil – into the river. The result? Drought in the fields while the river becomes increasingly distended. The pockets of hope along the river are often the result of forgetting – or ignoring – today’s conventional wisdom. “I don't think agriculture can keep going the way it's going,” says Duane Hager, a Minnesota farmer in Kellogg. As a hard July rain strikes his fields, they absorb the downpour with ease. Nearby, the fields of his neighbours pool over. 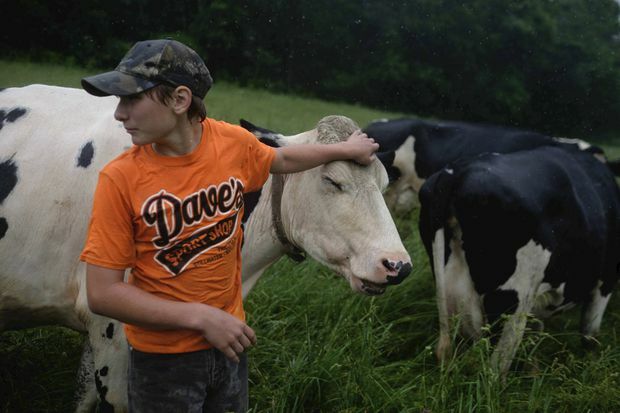 Duane Hager's farm in Kellogg, Minn., absorbs a heavy July rainfall. The bashful multi-generational farmer doesn’t believe he’s a maverick – he’s just been doing the same thing for years – and resisting farming trends that create new problems. This skepticism has led him to return to time-honed methods developed by a previous generations of farmers. These processes, including rotating his crops and planting alfalfa and oats, mean the soil on his land is crumbly and rich with nutrients – and is much less reliant on fertilizers. He’s modest about the changes he’s made. “I’m just a speck out here. When you think about the amount of land and everything else … What I do, don’t really mean anything,” he says. But soil experts agree that his method of farming has a lower environmental impact. “Even in the farming magazines, you didn’t use to hear about soil health and that stuff. I think the industry realizes what’s happening,” he says. Mr. Hager's son, Wesley, hopes to take over the farm from his father one day. On the river itself, restoration to its original state – or what policy-makers envision that might resemble – is now the aim of local governments. In a wildlife refuge bordering Minnesota and Wisconsin, efforts to build the natural landscape are succeeding. Reconstructed islands thickly covered in shrubs and reeds are home to birds and amphibians. 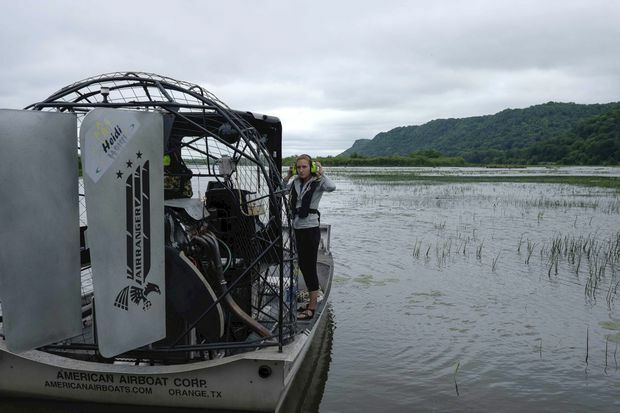 Calista Homan, an employee with the Wisconsin Department of Natural Resources, works aboard a boat to measure vegetation growth around the river and to monitor the health of the artificially constructed islands. Cities are beginning to resist the lure of flood walls, instead restoring forest and wetlands, even welcoming the flooding over the river each year in parks along the banks. Near the Twin Cities in Minnesota, community groups are fighting to have two locks and dams demolished, restoring the flow of the river and easing the concrete grip of the last century of river planning. 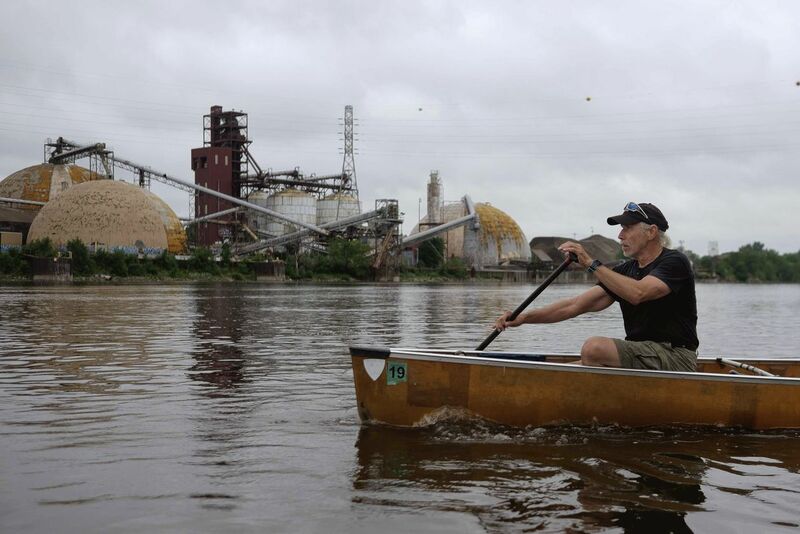 The Mississippi has endured before, and the hope for many is it will continue to endure – even flourish – into the future. In the 1970s, dramatic change proved possible. The Clean Water Act, federal legislation prompted by rivers burning from the level of pollutants in their water, put strict limits on what cities and factories could pump into the river. The result was near miraculous, transforming the body of water – which drains 41 states and two provinces – from a sewage channel into a restored source of useable water. 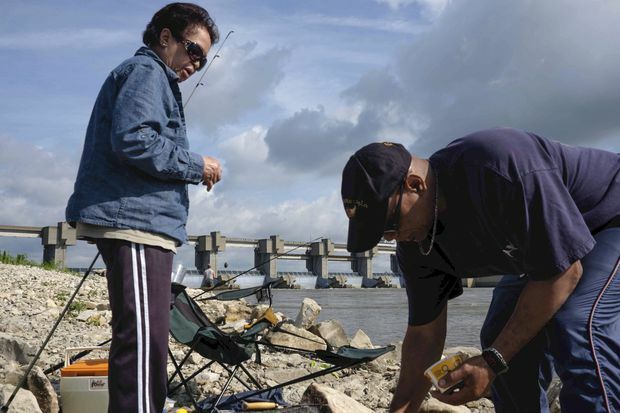 Kelvin Edmonds, right, fishes with his mother, Saybourah Edmonds, for drum and catfish in the Mississippi near the Melvin Price lock and dams outside St. Louis. The author’s reporting was made possible partly through a fellowship from the Institute for Journalism and Natural Resources. Editor’s note: Quincy is in Illinois. An earlier version of a map in this story located it in Missouri. This version has been corrected.